Hi everyone! It was some time since I WROTE something here (that post with the .gif of Chibs? I don't count as a post) but I'm back and I have news! 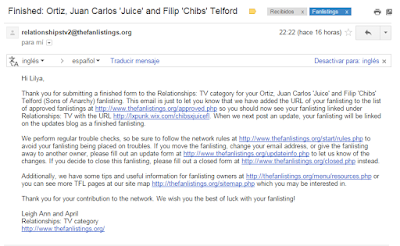 The title of this post has to do with my application to TFL.org about the fanlisting of the relationship between Chibs and Juice (SOA). Finally, this morning they sent me the confirmation that my FL has been approved. Looks great or what? In this case, I did a simpler layout and navigation than SOLDIER and I think it's better in this way so, in the future, I'll change the layout to Chibs's FL too (actually, I'm working on it). 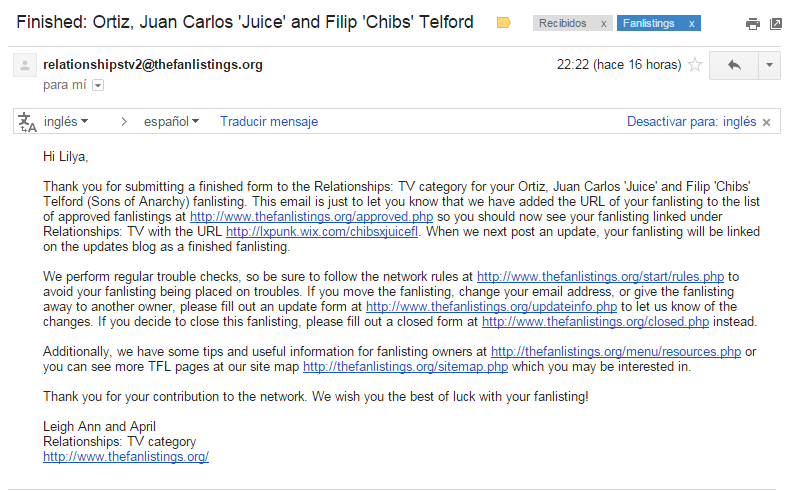 Anyway, check out my new fanlisting and join! I promise you that I'll post soon because I've a few new fangirl's stuff that I wanna show you (spoiler alert: SOA and Breaking Bad related).